May 3, 2017, 12:12 p.m. The Ghana Internet Services Providers Association (GISPA) and Ghana Internet Exchange (GIX) collaborated with Internet Society to organize the maiden edition of an Internet Peering and Interconnection Roadshow at the Swiss Spirits Hotel in Accra on 25th April, 2017. 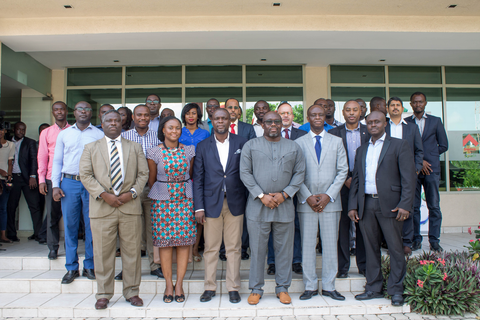 This roadshow brought together stakeholders from academia, private sector, regulator and government to deliberate on peering and interconnection issues in Ghana. In his opening remarks, the GIX Manager Mr. Emmanuel Kwarteng welcomed all stakeholders to the event and spoke about the importance of the Ghana Internet Exchange Point and the need for a deliberate effort to grow its presence in Ghana. He also hinted on ongoing discussions to connect the exchange point of Nigeria to that of Ghana, and plans on setting up a second point of presence at RackAfrica data center. In his welcome statement, the GISPA President, Mr. Ernest Brown sought to explain the relationship between GISPA and GIXA and the role GISPA played in the formation of the Ghana Internet Exchange (GIX). He explained the purpose of the GIX and said that it was the reason for the Peering and Interconnection roadshow. He went on to say that “the focus of the roadshow is on developing interconnection and traffic exchange opportunities by bringing together key players - infrastructure providers, Internet service providers (ISPs), Internet Exchange Points (IXPs), content producers and providers, data center operators, policy-makers and regulators, to advance the peering ecosystem in Ghana and by extension Africa”. Mr. Brown went on to say that his pre-occupation as GISPA President is to “ensure that the GIX grows stronger moving forward” and stated that this roadshow affords GISPA the opportunity to convince more infrastructure providers, Internet service providers (ISPs), Internet Exchange Points (IXPs), content producers and providers, data center operators to interconnect at the GIX and gain the immense benefits thereof. The Director General of the National Communications Authority was present and also gave a keynote address. In his speech, he spoke of the significance of the Roadshow to the people of this country collectively, and the importance the NCA places on the stake it has in the network initiated in 2005, which undoubtedly reduced the cost of electronic service delivery and has a potential to meet the telecom needs of the people of this country and beyond. He also spoke on the service excellence required of the GIX. “Ladies and Gentlemen, let me at this juncture state that the greatest expectations of the people of this country are the facilitation of high quality service experience delivery, access and affordability in the telecom sector. It is in this light that a greater responsibility is required of the GIX network to ensure the provision of high quality of service delivery for all their customers, to yield the desired dividends that are mutually beneficial to both parties”. He also mentioned that it makes sense for all local content produces to host their content in Ghana to make it easily accessible to the Ghanaian end user and encouraged all such producers to peer directly at the exchange to widen their reach as most providers already peer at the exchange. The Guest of Honour for the event was the Deputy Minister for Communications, Hon. George Andah. Hon Andah, reiterated on the importance of the GIX which allows Internet Service Providers, Network Operators and other peers to exchange traffic within Ghana, while improving connectivity and quality of service to the end user. He also indicated that the Government of the day would create the enabling environment and also work to enhance greater competition among private sector players so that they would be encouraged to invest resources to improve upon their services. Hon Andah indicated also the need for local content producers to produce more content and encouraged them to host them in the Country, which currently has reliable data centers and also peer at the Ghana Internet Exchange Point. The facilitator from Internet Society Michuki Mwangi, took all stakeholders through the importance of the having this roadshow. He went through several presentations with stakeholders throughout that day on peering best practices, peering and transit business development and advancing the peering ecosystem.